© 2011-15 Kaleidograph Design LLC. Explore symmetry and color combininations. See how small adjustments produce dramatic changes. 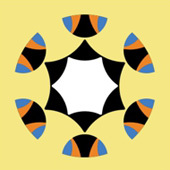 The elegantly simple Kaleidograph can be arranged into billions of designs by combining and rotating the variety of die-cut cards. Each set also includes a full-color, two-sided insert with 68 example designs to challenge and inspire. • About the size of a thick CD case — 4-3/4" x 4-3/4" x 3/8"